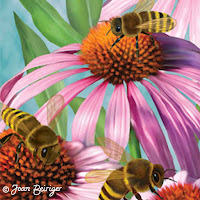 A major key to license art is to get your art out into the world so that clients and consumers are aware of it. And, ways to gain visibility is to actively market your art with publicity (news releases, advertisements, exhibiting at trade shows, etc. ), having art on products at retail, and networking via social media such as Facebook, Linkedin, blogs, and twitter. Writing a blog is considered one of the best ways for people to get to know and connect with you. It is also a good way to market your art. Artists are often hesitant to start a blog because they heard that you need to produce a post each day and they just do not have the time. However, blogging is still an effective marketing tool even if you do not post daily or weekly. For more information about how often you should post, read founder and editor of ProBlogger Blog Tips Darren Rowse's article "You Must Post Every Day on Your Blog (Misconceptions New Bloggers Have #2)." Even if you want to have your own blog, you may not know what to write about. Some artists use a blog to showcase their art, and/or show their licensed art on products, and/or discuss how they get inspiration to create their art. Others use it to voice their opinion, interview people in the industry, or share information. Blog articles do not need to be long but should contain content. Some blog experts state that a good blogger uses the 60/20/20 rule. 60% of the content of the blog should be useful information for the target audience, 20 % should be used to promote others and 20% to promote yourself. They also suggest that each article include a picture(s) to create interest. Note: This is one way an artist can market their art by using the art to illustrate the content in an article. Having engaging and varied subject matters entices readers to view blogs. Some bloggers may give away free things, have contests and drawings, have a blog hop (see below for an example), list resources, give tips, and show how-to-do something. Also using keywords in blog articles to optimize search engines helps drive readers to the blog. For more about search engine optimization (SEO), read "Search Engine Optimization and Blogging." Below are some examples of blog posts that artists, agents and manufacturers have used to drive traffic to their blogs. – manufacturer Clothworks "Valentine Quilt Kit Giveaway!" 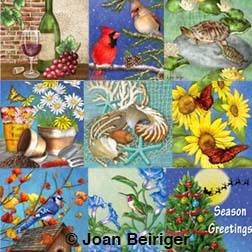 – artist Phyllis Dobbs - "Free Patterns for Bee Yourself Fabrics"
– artist Jane Maday - "Emerald Green"
– artist Jody Bergsma "Mysterious Aqua Blue and a Trip to the Sea"
– manufacturer Magnet Works, Ltd. - "DrinkBlots - Made in St. Louis, USA"
Blog hops are a list of links that a group of bloggers post on their blogs so that readers "hop" from blog-to-blog and see the same theme on each blog. Successful blog hops have an interesting theme that is an incentive that drives traffic to each blog. A good example of a blog hop is by artist Aaron Christensen and 11 other artists that showcased their studios in 2012 "Hi Resolution - A New Year's Studio Meet and Greet." A simple rule that I have often heard about creating successful blogs is to post a picture, post often and post short (length of article). But just like many things in the art licensing industry it depends upon the usage and circumstances. Not all posts need a picture but for art blogs it sure is a good opportunity to market art. 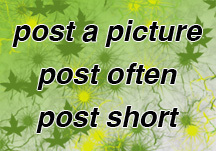 And, posting often and short can mean different things to each person. Thus, it is up to the blogger to make the decision how often she/he should post and how long the articles should be. 3. Be a content creator, not a content recycler. 7. Re-read and edit each post before you publish it. Two of the most popular free blog software is WordPress and Blogger. To find out about them and others, read "2013 Best Blog Software Comparisons and Reviews."